Remember my fondness for anything from Pottery Barn? It's one of the gold brand standards that buyers will pay big money for. The brand is so popular a rock painted egg shell white with "Pottery Barn" chiseled on it would sell! For real.....buyers go nuts for Pottery Barn! So imagine my joy a few months ago when I came across this Pottery Barn lemonade stand. Even a lug like me can tell this is high on the "cuteness" meter! I found it at a garage sale in one of the local neighborhoods. While perusing the yard sale at this big fancy home, I glanced into the seller's garage and saw this sitting there. It would have been hard to miss, what with all it's bright white paint. I asked the owner if it was for sale? To my delight she told me it was. She then picked up the lemonade stand and carried it out to her driveway. I commented how neat looking it was and then she said the magic words, "Thanks...I bought it at Pottery Barn." DING-DING-DING! Alarm bells went off in my head! This thing was oozing cuteness and was from Pottery Barn! Trying to contain my excitement, I casually asked the seller how much she wanted for the stand. It was a little dusty, so she began wiping it down with a paper towel and some spray cleaner. She was one of these "busy-bee" Moms-the type who can't stand still for a moment to talk. She continued to wipe down the top and began to work me at the same time, "Well I paid a lot for it, but I would take $25 dollars." With that, she kept spraying and wiping down the stand. I thought for a second and then countered, "I'll tell you what...how about twenty and you don't have to bother cleaning it?" She stopped wiping and thought for a few seconds. Crumbling up her paper towel, she said "Ok, I'll take twenty for it." 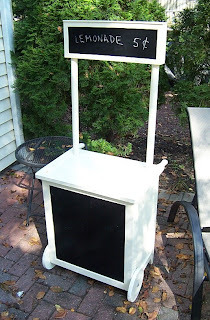 I peeled off a twenty and carried my awesome Pottery Barn lemonade stand down to the truck. After stowing the stand in the truck bed, I went back and bought a few more things from the lady. She had some nice merchandise; a set of fancy lampshades, a few more toys, all good quality stuff. After paying her, I left wishing I could find more garage sales as good as this one was. Sometimes after I get home from the sales, I'll stage my finds prominently in the house. It's a way to show off my stuff, plus I like to see how the family reacts when they notice a new treasure. In this case, I positioned the lemonade stand in the family room where I knew my gang would spot it. My staging caught the attention of Mrs. Dude when she walked into the room. She spotted the lemonade stand and gushed out, "Ooooh, that's really cute!" Hearing this, I knew my Pottery Barn find was a winner! Now it was time to sell. Something the size of a lemonade stand is pretty difficult to ship, so I went with a Craigslist ad over eBay. I did some internet searches on the stand and found that PB doesn't make this model anymore. This is always a good sign, making the piece even more attractive to buyers. I snapped a bunch of pictures of the stand in my backyard. Adding to the "cute" factor, I scribbled "Lemonade - 5 cents" on the overhead chalkboard. Nice touch right? I would have placed an old fashion pitcher on it too, but just couldn't find one in the house. Originally, I thought selling the lemonade stand would be a little difficult since the weather was turning colder. What kid is interested in selling lemonade in cold weather? For a few weeks prior to Thanksgiving this turned out to be true-I didn't receive any offers. But then I posted it again for the Christmas buying season. A nice flurry of e-mails began coming in, including a Mom who wanted it for a Christmas gift for her daughters. She drove to my house on a dark, cold night in early December and paid me $85 dollars for the lemonade stand! That gave me a profit of $65 dollars...a nice return on a twenty dollar investment! So once again Pottery Barn came through! How about you? Any good PB stories or other gold standard brands? As the Christmas selling season winds down, I'll bet everyone has story or two...share them below! Thank you for writing this blog. I really enjoy reading your tips and tricks. I found a Pottery Barn Shark Costume just before Halloween for $8.00 and sold it for $65 on e-bay. That was fun. Anonymous - Thanks, I am glad your enjoying the blog. I didn't know PB sells costumes too, something new to look for at the garage sales! And turning $8 into $65? I'll take that all day long...nice flip! Hey Dude! One thing I have to throw caution to in regards to PB (no, not peanut butter LOL). You might want to stay clear from any PB bedding (be it crib bedding or adult bedding or teen bedding), unless it is ultra rare. Because if you type in Pottery Barn in ebay, most all of it is crib or other bedding. It's too overloaded with that stuff. Thus, too much competition. Plus, every time I ask a mom how much for the PB crib set? She always says, I paid a lot for that, and it's always an arm and a leg that she ends up wanting for it. So, when I flip it, I usually don't make much. Happy holidays! Hey GSA- Great to hear from you. You're right, you can run into the sellers who quote you close to retail prices. They seem to forget it's a yard sale and not the actual Pottery Barn store! I am not a bedding buyer, so I appreciate you passing along your experience in sell PB bedding. Sounds like unless you can get PB bedding super cheap, it's better to stay away from the stuff. Thanks for the tip and Happy Holidays! I am with you Dude-I buy almost anything Pottery Barn. :) The kids quilts do sell well. I have sold quite a few twin sets (with the shams) in the $50-$60 range depending on condition. People will pay for their cute kids quilts, but I agree that duvets, crib bedding, and adult bedding is in general a no no. Another brand I do well with is Ralph Lauren. People will buy almost anything Ralph Lauren-I have sold LOTS of bedding, mugs, hats, clothing, etc. If it has that little horse on it, it is golden! A tip I have done well on is just random flat or fitted sheets. I just recently sold a queen flat sheet in a retired pattern for $35 and I picked it up for a buck, plus easy to ship! Anonymous- That's the type of good info we all can use....PB kid's quilts are a buy, as is Ralph Lauren. Your little description of the horse will help me remember when I am going through the GW racks and garage sales.